Trappings of Texas 2019 Sponsorship Levels include admission to some or all of these events. Click here for full details. 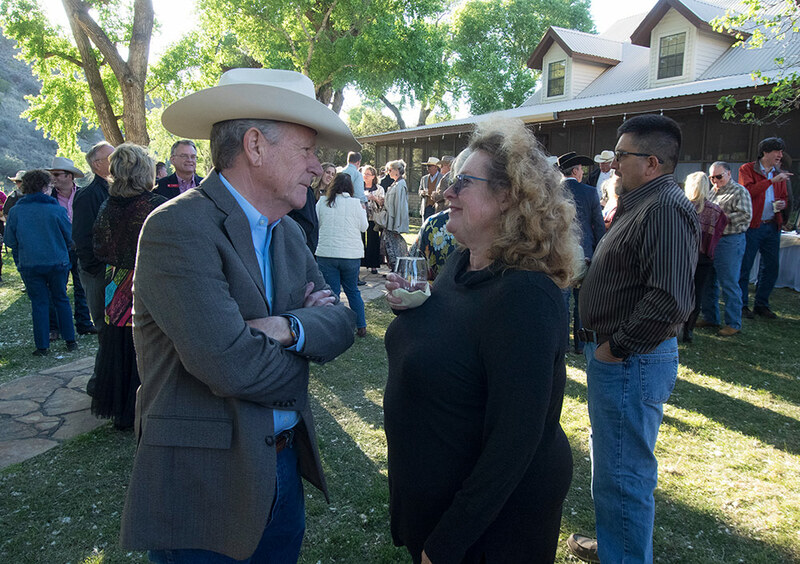 Previous Ranch Round Up Party. Click here to see all of our 2019 Sponsors. Enjoy this exclusive and intimate opportunity to view Trappings first! This is the only opportunity to pre-register as a buyer, obtain your Buyer’s Ballot Book and begin dropping ballots in advance. Underwriting support courtesy of Porter’s Thriftway. Kick back and enjoy a terrific array of appetizers in the Courtyard of the Holland Hotel. A cash bar will be available. If you are interested in a seated dinner afterwards, reservations are recommended. Call the Century Bar & Grill at 432-837-1922. Performance by Alpine’s The Swifts providing eclectic, harmony based acoustic music. All Trappings of Texas 2019 Sponsorship Levels include access to the Preview & After Preview Party. Click here to find out more about Trappings of Texas 2019 Sponsorship Levels. Enjoy an authentic Texas BBQ lunch with the artists of Trappings of Texas. A cash bar will be available. Enjoy a blast from the past with aspecially curated slideshow featuring works, artists and friends from the past 10 years of Trappings of Texas! You never know who might show up. Tickets for the Meet the Artists Luncheon are included in the Cattle Baron, Gold Cattle Baron and Diamond Cattle Baron Sponsorship Levels. Click here to find out more about Trappings of Texas 2019 Sponsorship Levels. The Don’t Miss Party in far West Texas! Become a buyer, drop a ballot and you may be the lucky owner of one of the many great works of art in Trappings. Listen for the sound of the gong as the sale closes and find out if your ballot has been drawn! All evening long, enjoy great food and drinks while visiting with Trappings artists along with new and old friends alike. The shrimp and carving station are back! Underwriting support courtesy of the Brewster County Tourism Council and Porter’s Thriftway. All Trappings of Texas 2019 Sponsorship Levels include access to the Grand Opening Exhibit, Sale & Reception. Click here to learn more about Trappings of Texas 2019 Sponsorship Levels. Admission is free, reservations are requested. Sponsored by Gary Dunshee, Big Bend Saddlery. If you have attended a recent Texas Cowboy Poetry Gathering, then you have had the good fortune to hear a performance by singer/songwriter Mikki Daniel. 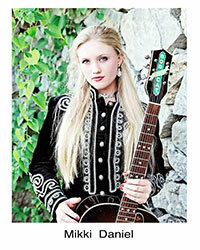 From Luna, New Mexico, Mikki returns to Alpine and will read from her debut historical fiction novel Girls & Gunsmoke. This work has received awards from the North Texas Book Festival for Young Adult Fiction and the Will Rogers Medallion Award for Inspirational Fiction. Mikki will have copies of Girls and Gunsmoke available for signing and purchase. Admission is free, reservations are requested. Sponsored by Trappings artist Brooks Atwood. 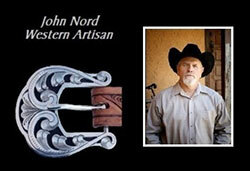 Trappings of Texas artist John Nord of Talpa, Texas, will talk about making spurs, from the traditional old ways to the more modern ways of the gear makers today. He will also cover fabrication, as well as embellishment including inlay work. 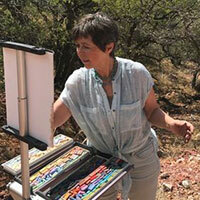 Join Trappings of Texas artist, Lindy Cook Severns, Fort Davis, Texas as she discusses the art of plein air or painting in the outdoors. The Brown family came to Bee County from Georgia after the Civil War. Ranching began when the first Austin Brown bought his initial ranch north of Beeville in 1924. The ranching tradition continues to this day in the Brown family with Austin Brown, II and Austin Brown, III working the ranch where they raise and develop Hereford, Angus, Charolais, and Akaushi bulls and heifers for select customers across the state. Austin Brown, II will share with you some of his poems from his publication Poet Lariat: Cowboy Poems From A Ranching Life that represents his 75 years of experiences on Texas and Southwestern ranches. The book is illustrated with pen & ink drawings by Trappings of Texas artist Mike Capron alongside photos that document ranch life. 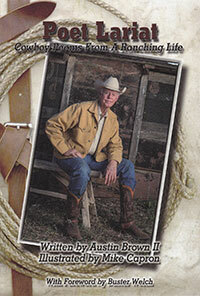 Austin will have copies of Poet Lariat: Cowboy Poems From A Ranching Life available for signing and purchase. 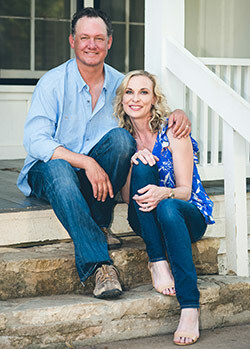 Cocktails, dinner and live music under the stars at the historic Que Dice/Stringfellow Ranch hosted by owners Jeff and Erin Williams (photo at left) and their daughter Alexandra. Click here for more information about the Que Dice/Stringfellow Ranch. Evening activities include an Auction and a Wine Pull. Music will be provided by Mikki Daniels, 2017 WMA Female Performer of the Year and 2017 Will Rogers Western Music Female Award recipient and 2018 nominee. Dinner catered by the Brick Vault Barbecue, Gage Hotel, will feature their 44 Farms brisket, smoked turkey breast, family-style sausage and all the trimmings. Tickets for the Trappings of Texas Ranch Round Up Party are included in the Gold Cattle Baron and Diamond Cattle Baron Sponsorship Levels. Click here to find out more about Trappings of Texas 2019 Sponsorship Levels.